Prior to our trip, I did quite a bit of online research for Disney tips, tricks and other miscellaneous information. I came across so many interesting things. One of my favorite little tidbits, was found on tipsfromthedisneydiva.com. 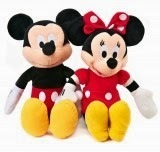 The Disney Diva shares an anecdote about a trip to Disney where a 12 year old girl approached the Diva and her daughter to share a plush Minnie Mouse. The 12 year old's mother proceeded to explain that each trip they buy a toy for their children to give-away to another child to "create some magic for another family." The Disney Diva and her family started a similar tradition. She shares; "throughout the trip they look for families with children in melt-down or just being pushed down the street in their stroller. When they feel the child is JUST RIGHT for their toy they approach the family and ask permission to give their toy away." "So this is the Diva Family Challenge to you on your next trip. Are YOU willing to make some magic for another family? Give it a try and see if it doesn’t turn out to be the highlight of your trip." Well, after reading the post, I thought it was the most brilliant idea EVER! I was ready to take the challenge. I shared the story with my 4 year old son, and asked him if this was something he was interested in doing? His face brightened at the idea of sharing some magic with another boy or girl during our trip. CHALLENGE ACCEPTED! So, we went on a search for a small plush Minnie and Mickey. We happened upon some perfect ones at CVS (of all places). We wrote up some notes and tied them to Mickey and Minnie's arms (a little rhyme to share a smile and an explanation of our new family tradition). My son was very proud to pack them in his suitcase to Disney World. After we arrived, we made sure we had one of the plush dolls with us in a backpack at the parks. My son kept an ear and a eye ready to identify a "friend" having a bad day. Our first friend who needed a smile we found at Hollywood Studios. We had just gotten off Toy Story Mania, and could hear someone crying nearby. We looked around, and saw a mom with her crying daughter in a stroller. I looked at my son, asked if this was someone he thought needed a little smile, and when he responded "Yes", we walked over together with of the plushes in hand. As we approached the pair, I explained to the Mom that we have this plush, and can see her daughter was in need of a smile. I asked if it was okay if my son could give her daughter the plush. After receiving approval, my son peeked into the stroller, offered the plush, and instantly the little girl stopped crying. I read her the rhyme and told her that we hope she'll keep a smile for the rest of the day. Even the mom had a smile. Our second friend who needed a smile was in EPCOT. We followed the same protocol as before, with my asking the mom and giving an explanation first. Turned out, the friend we heard had siblings as well who were succumbing to a long day. We spoke to the girl, and I even asked her if she could share the Mickey with her siblings to give them a little smile. After both encounters, my son and I had even bigger smiles, knowing that we shared a little magic with others. We didn't ask for anything in return, we never gave our names. We actually saw one of our "friends" later in the day, but didn't draw attention to ourselves. We smiled as we noticed there was not an unhappy sound that followed. We helped make a little extra magic, and it felt really good. 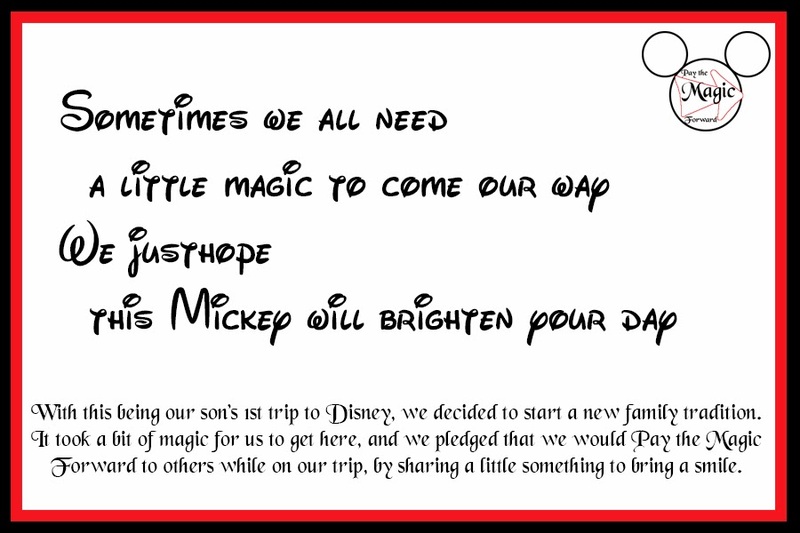 So, as the Disney Diva issued in her blog, I am doing the same here and challenging YOU to make a little magic for another family during your Disney trip. It really does add that special something that you will remember, and possibly a memory another family will have with them forever.